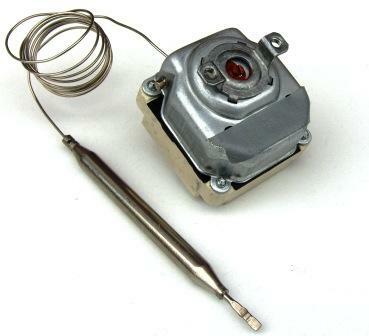 For over 75 years now, the E.G.O triple pole capillary thermostats have proved effective in regulating and controlling heated appliances. The growing demand over the years has resulted in an increase in production to meet the needs of customers through the globe. By the end of 1998 E.G.O had supplied millions of triple pole thermostats to customers in the Domestic, Commercial and Industrial market sectors. This increase in demand has allowed E.G.O to rationalize their production operations, which consequently enables them to offer competitive prices. The above thermostat is a typical E.G.O triple pole capillary thermostat, with change over function - Type: 55.34.series. 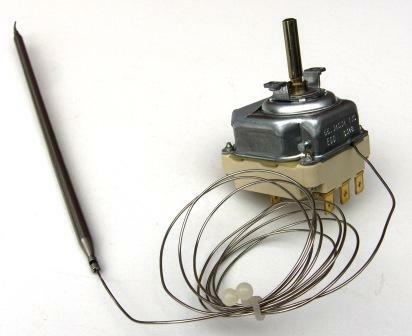 The Triple pole capillary thermostat is identified by the number of contact terminals on the rear of the unit. Each pole operates independent of the other two contacts during operation. Operation - The principal by which a triple pole capillary thermostat operates is that of liquid expansion. The hydraulic thermal system (Diastat) consists of the sensor, the capillary tube and the diaphragm. When the sensor heats up, the liquid expands through the capillary tube into the diaphragm where the working stroke is produced, By generating the working stroke, a snap-action switch is actuated which opens or closes the electrical circuit. These triple pole capillary thermostats are intended to regulate the temperatures of liquid, gases or solids. With E.G.O's impressive R & D facility, they are able to develop the triple pole capillary thermostat in order to suit most customer applications and volumes. 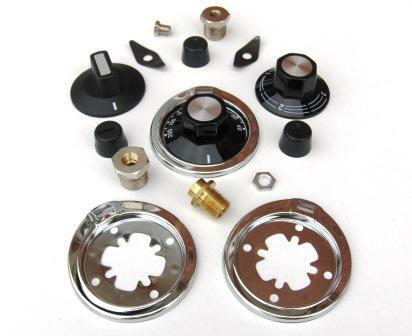 The E.G.O Thermostat can be supplied with calibrated control knobs and accessories such as gland assemblies for securing the sensor inside an appliances. Note: For advise on selecting the correct thermostat for a new or existing application, please contact our office for technical advise.